Goodbye 2017. Hello 2018. It’s time to let go of a whole year of ups and downs, highs and lows and all the things in between to make room for what’s next, and more importantly for what’s right here in front of us. I love the sentiment, but instead of throwing things out of your window, I have some other (safer) recommendations for you to say goodbye and hello. Challenges and experiments and playing with structure and flexibility has been a powerful part of my simplicity journey. If you want to simplify in 2018, or create more time and space to remember what matters to you, please consider these 5 fabulous ways to kick off a brand new year. 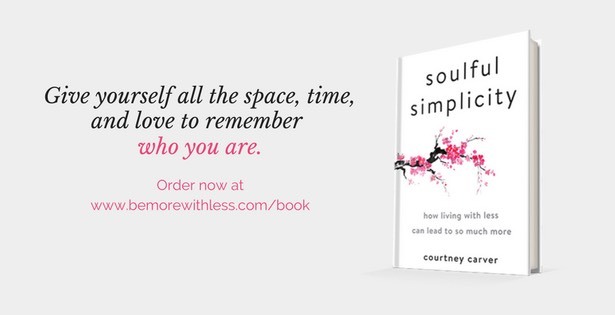 In my new book, Soulful Simplicity, I don’t offer a methodology or specific plan, but instead invite you to create your own. I share my story, some helpful tips and tricks and a heart practice that will help you remember you, what you stand for and what you want your life to be like. Find the book here. The simplicity inspired bonus gifts will be available through the end of 2017. Join me on tour here. I’ll be in 12 cities in January and February. Each ticket comes with a hardcover copy of Soulful Simplicity. Tell me what you think. If you’ve already read the book, thank you! Please tell me and others about your experience by leaving a review on Amazon by clicking here. Simple is the new black. 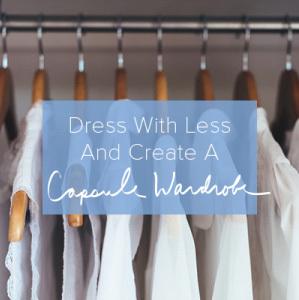 Simplifying my closet didn’t just change my wardrobe, it changed my whole life. 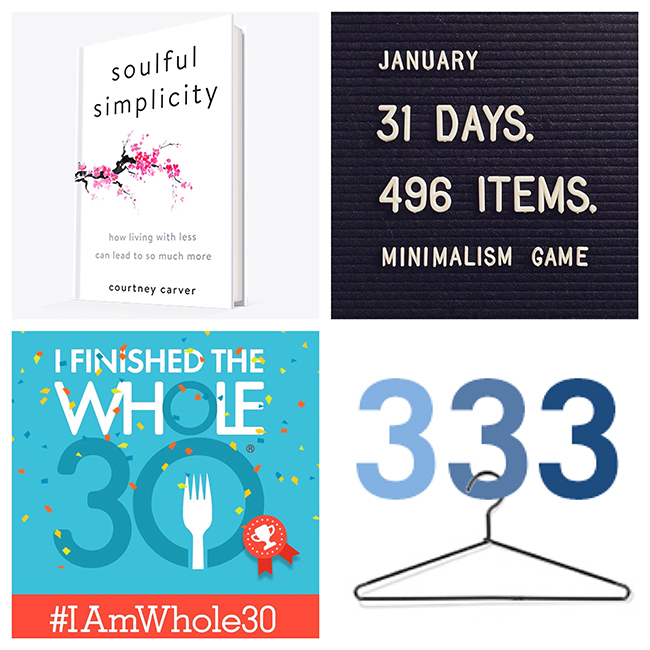 Discover what enough means to you, save money and look forward to chaos-free mornings with minimalist fashion challenge Project 333. All the rules are right here. If you are ready for slow, steady and supported change, consider A Simple Year. For the 5th year, A Simple Year returns inviting you to join in for 12 months of guided simplicity with our wise and thoughtful contributors. They’ve been through what they are teaching each month. They walk the walk. They’ve made mistakes, slipped and started over. They’ve learned what works and how to approach change and they are excited to share what they know with you. What I love most about our contributors is they care. They truly care about their work and your journey. You can find a full description of the 2018 monthly contributors and topics at simpleyear.co, but here’s a quick glimpse of what to expect. Each month we’ll cover a single topic so you can focus on one change at a time. 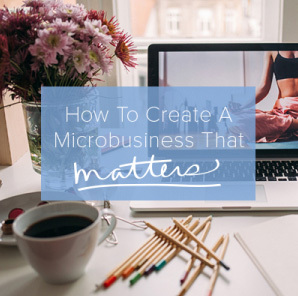 The content will include written articles, audio and video recordings and live Q & A webinars. Topics include clutter, busyness, digital, cooking, travel, mindfulness, money, self-care, relationships, cooking, gifts and gratitude. Because we know that a year may only be the beginning of the big, beautiful changes you want to make, you’ll have life-time access to the course. At the end of the year we’ll send you a PDF with all of the lessons and recordings so you can revisit topics and dig deeper when the time is right for you. Join here until January 31st. Some think my simplicity journey started in my closet, but it actually started with my diet by eliminating certain foods that I thought were impacting my health in a negative way. I wanted to live well with Multiple Sclerosis, so after my diagnosis I changed my diet. Years later, I did The Whole 30, described as “a short-term nutrition reset, designed to help you put an end to unhealthy cravings and habits, restore a healthy metabolism, heal your digestive tract, and balance your immune system.” Learn more here. Those are a few recommendations but most of all I recommend that you do what’s best for you. I love sharing what’s best for me, and ideas and challenges I think will resonate with you, but in the end you have to do what’s best for you. If you want to know what’s best for you, experiment, be curious, listen to your heart and remember you know you better than anyone else. Do whatever it takes to create an environment where you have a little time each day to sit quietly to listen and trust your heart. Clear the clutter, busyness, stress, and everything that doesn’t matter so you have time and attention for what does. Sometimes it’s hard to know where to start, but if done with love and intention, you can’t start in the wrong place. Take a big deep breath as you say goodbye to 2017 and say hello to a brand new year with your hands on your heart. Let’s step into the new year together. We’ve got this! These are great recommendations. There are so many things floating around this season for new years resolutions and goals… And really, all I want is a less cluttered apartment, less cluttered life, and a healthier body. Hope to continue decluttering my life and environment in 2018! Great tips! I paired down my closet and my dresser over the holidays and I am moving on to looking at goals and task related to reaching them. My question to myself is this. Is the long term goal related to the task at hand really needed? Maybe, I don’t need to purse so many interest.